The mystery of Rennes-le-Château is predicated on two primary elements; (1) the Priory Documents and (2) the Archaeology & Artefacts of the legend. Let’s take a closer look at each and reflect on what they tell us. The Priory Documents are a collection of papers, clippings, and genealogies that were deposited in the French National Library (Bibliothèque Nationale) between 1964 and 1967. Essentially, the documents comprise the essence of what we know about the legend of Rennes-le-Château. They also provide considerable insight into our understanding of the Priory of Sion. Put another way; if the Priory Documents did not exist, nor would the legend of Rennes-le-Château. So what do we know about the documents? For a start, their authenticity is extremely questionable. Not only are the documents difficult to corroborate with other historical sources, but equally worrying, the identities of those who authored and deposited them in the French National Library appears entirely fraudulent. In fact, most were deceased by the time the Priory document was authored. In several instance, the would-be author never existed in the first place. What better way to ensure that someone does not object to being entwined in the story? 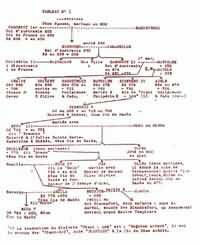 Genealogy of the Merovingian Kings 1964 Henri Lobineau,a supposed Pseudonym for Leo Schidlof Contains various genealogical tables linking the Plantard family to the Merovinginians, as well as detail on the lineage of Dagobert II. The file is said to have been first published in Geneva in 1956. Nicolas Poussin is featured, as is his painting Shepard’s of Arcadia. A map o f the old Aude, the region around Rennes-le-Château is provided. Another document, ‘The Enigma of Rhedae’ details Saunière’s trip to Paris and the history of the mystery. (13 May) Antoine l’Ermite (Anthony the Hermit) This ten page booklet was first published in 1961 and recounts the conventional story of Rennes-le-Château. Most of it is told in an interview style, quoting from Noel Corbu, the local businessman who purchased Saunière’s estate after the Abbe’s death. Suspiciously, the author’s name translates as Anthony the Hermit, the name of one of the three paintings Saunière allegedly purchased in the Lourve, in Paris, after having made his discovery. (20 June) Antoine l’Ermite This priory document is a particular confusing collection of plates from a book that appears to have never existed; the Engraved Stones of the Languedoc by Eugene Stublein. Oddly, many authentic plates are incorrectly attributed to him. 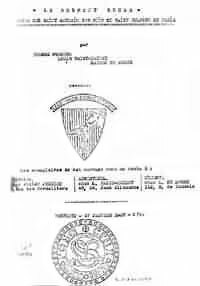 It would appear that the purpose of the document is to establish the credibility of the code found on the Tombstone of the Nobel, Marie de Nègre d’Ables. Gaston de Koker The Red Snake is a bizarre collection of twelve lucid poems, one for each sign in the zodiac. Many reference Rennes-le-Château, The Rose Line, ‘Et in Ardadia Ego’ or Saint-Sulpice. The document includes two Merovingian period maps of France, genealogies, and the ground plan of Saint-Sulpice. Suspiciously, the documents three authors hung themselves, entirely independently, on or around the same day, before the document was filed. The Secret Files of Henri Lobineau 1967 Henry Lobineau The Secret Files of Henri Lobineau consists of a disjointed collection of clippings, genealogies, maps and alternative versions of the mystery of Rennes-le-Château. Many appear to link Pierre Plantard with Dagobert II and the rightful successor to the throne of France. Another establishes the Priory of Sion as having been founded in 1188, by Jean de Gisors. 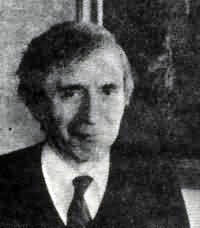 Rene Descadeillas, a respected French journalist and local historian from Carcassonne, reported on Saunières life, circa 1962. Descadeillas believed the Parchments never existed! Frankly, given the questionable integrity of the catalogue of work, who can blame him? Clearly, the Priory Documents represent a complex, long term approach to manipulating history. They also appear to be the fraudulent work of a few, shadowy puppet masters, namely Pierre Plantard and his colleague Philippe de Cherisey. The motivation and behaviour of these figures is arguably the real mystery of Rennes-le-Château (but more on that another day). But why go to all that trouble? The Priory Documents appear to be an elaborate hoax, and consequently are of little historical value, at least with respect to the history of Rennes-le-Château. So where can we turn? The archaeology and artefacts of the Rennes-le-Château legend are inexplicably associated with elaborate codes and ciphers, which in turn links them with the Priory Documents. Like most of the collateral in the Rennes-le-Château legend, the authenticity of the codes and ciphers needs to be carefully examined before conclusions can be drawn. Allegedly, Parchment #1 was discovered by Saunière in the Visigoth pillar of his church, circa 1891. It consists of a hand penned rendition, written in Latin, of the biblical text of Jesus visiting the house of Lazarus. Gerard de Sede published the only known copy in his 1967 Book, The Gold of Rennes, although he claims to never have seen the originals. Much later, a portion of the decoded message would morph into the belief that Blue Apples appear in the church of Saint Mary Magdalene, at noon on the 17th of January. Shepard, no temptation, Poussin and Tenniers hold the key. Peace 681. By the cross and this horse of God, I finish off this guardian demon at midday. Blue apples. REX MUNDI, the Cathar term for Satan, or King of the World, is also highlighted in document. Parchment 2 Parchment #2 was also discovered by Sauniere in the hollow of the Visigoth Pillar. In this instance, the biblical text highlights the disciples picking and eating corn on the Sabbath. The word SION appears diagonally and the letters PS appear in the right hand corner. Henry Lincoln and others after him observe significant pentagonal symbolism in the parchment. Curiously, author Gerard de Sede had not decoded the parchment in his 1967 book, The Gold of Rennes, leading many to ponder just who the puppet master really was (is). TO KING DAGOBERT II AND TO SION BELONGS THE TREASURE AND HE IS THERE DEAD. TO KING DAGOBERT II AND TO SION BELONGS THE TREASURE IT IS DEATH. There is also a reference to Redis, which may refer to Rhedae, the alleged name of Rennes-le-Château in ancient times. 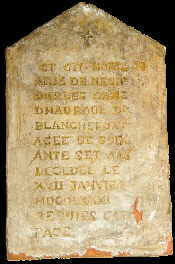 Nobles Tombstone #1 The only record of the vertical Tombstone of the Noble, Marie de Nègre d’ Ables, is a sketching in the Aude Society for Scientific Studies Proceedings of 1905. Saunière is said to have defaced the Tombstone in 1895, after digging in the vicinity of her grave for several nights. How could this be? The Nobles tombstone resided in the Rennes-le-Château church cemetery. Raised and offset letters reveal the keyword (MORTEPEE) necessary for decoding the more complex Parchment #1. The remnants of the stone have been preserved in the museum in Rennes-le-Château. There is no historical account of the horizontal Tombstone of the Noble, Marie de Nègre d’ Ables. Gerald De Sede was the first to reference it. He said a picture of it is recorded in the book, Engraved Stones of the Languedoc by Eugene Stublein, but no copies of the book have ever been discovered. The Aude Society for Scientific Studies visited Rennes-le-Château at least twice, and never mentioned it, thus shedding considerable doubt on its existence. ET IN ARCADIA EGO (Even I, Death, am in Arcady). This same expression is found on Nicolas Poussin’s Shepard’s of Arcadia. 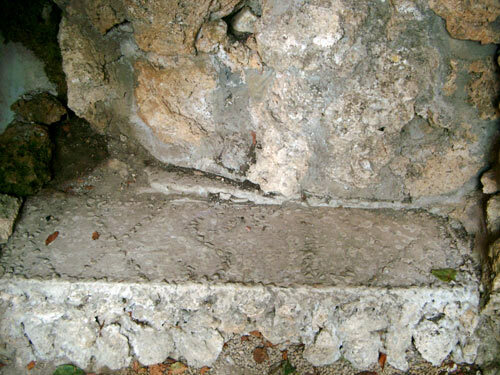 The Slab Stone of Coumesourde The location of the Coumesourde stone is unknown today. 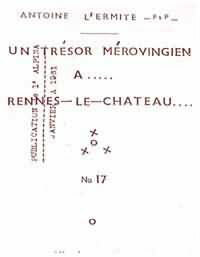 The stone was supposedly discovered in 1928, near Rennes-le-Château and has been preserved in a drawing by local amateur historian Ernest Cros, an acquaintance of Abbe Saunière. 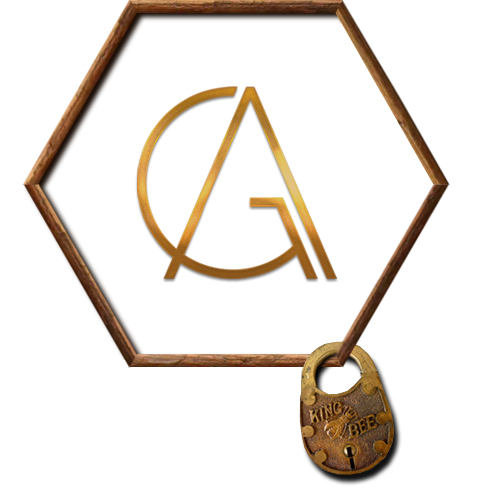 It appears to be the invention of Gerald De Sede, or his associates, as it was introduced in his book, The Gold of Rennes. 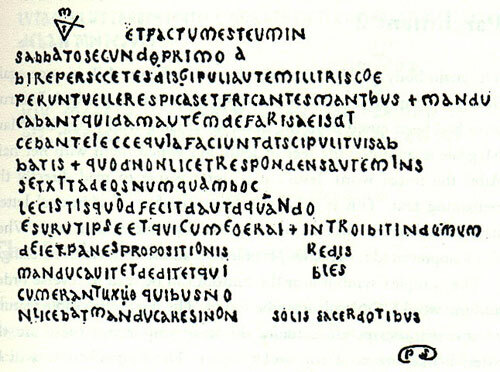 The stone, which is discussed in a 1964 paper attributed to Noel Corbu, appears to portray a treasure map of the Knights Templars. It spells PS PRAECVM, which is translated as ‘treasure of the Templars’. Corbu believed the stone referenced Blanchfort, Black Rock and the Castle of Bezu, all local esoteric sites. While restoring the church of Saint Mary Magdalene, Saunière relocated the ancient pillar that supported the old alter to a prominent location outside the church, near the entrance, and adjoining his home, the Vila Bethany. Sauniere placed the pillar upside down to support a statue of the Virgin Mary, and carved MISSON 1891 on the bottom and PENITENCE! PENITENCE! on the top. Oddly, the carving of PENITENCE PENITENCE appears to be misspelled. 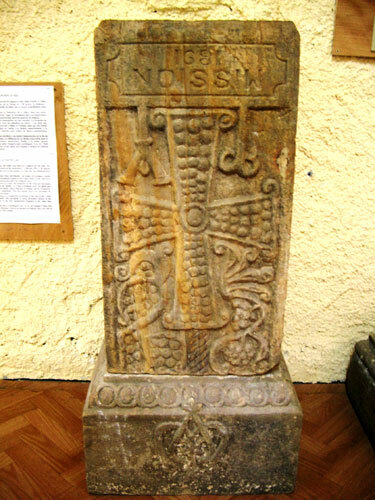 A replica of the pillar remains in situ while the original is preserved in the Berenger Sauniere Museum. The choice of PENITENCE! PENITENCE! appears to commemorate the 8th apparition of the Virgin Mary by Bernadette, at nearby Lourdes: Penance! Penance! Penance! The carving of MISSION 1891 is also peculiar. For instance, 1891 was the year Saunière discovered a tomb, as well as the year he began his relationship with his helper and alleged lover, Marie Deneraud. Oddly enough, when the pillar is turned right side up, it reads 1681. Pierre Plantard believed the Priory of Sion was founded in Rennes-le-Château in 1681, and became Grand Master of the Priory of Sion in 1981! Further, Marie de Nègre d’Ables, the Nobel whose tombstone Saunière defaced (see above) states that she died in 1681, although she actually died in 1781. 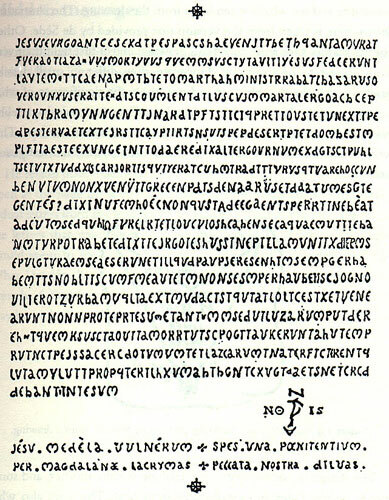 Curiously, “Peace 681” appears in Parchment #1. Near the entrance of the church of Saint Mary Magdalene in Rennes-le-Château is a replica of a stone grotto. The grotto was personally constructed by Sauniere, and was originally aligned on the Tour Magdela, some 75 yards in the distance. The grotto was vandalized by treasure seekers and has been reconstructed on a slight variance from the original. The grotto is constructed with tufa quarried from the fields to the south of the village, where the priest hiked with a suitcase or rucksack on many occasions. Sauniere built an extension to his church that allowed him to conceal his actions from the parishioners. He frequently went straight into these private quarters after his walks. On the bench of the grotto Saunière placed the characters ‘XXSLX’, in large letters that span the width and length of the seat. The characters are especially curious as there is no ‘S’ in Latin. Nobody has come close to decoding it, assuming it is a code. The grotto contained a statue of Mary Magdalene, which has long since vanished. This is not surprising, given that it is aligned on the Tour Magdela, or Tower of the Magdalene, which is aligned on a grotto called ‘Grotte du Fournet – dite de la Magdeleine’, which translates as ‘The Burial Site of the Mary Magdalene’. See The Grail and the Grotto. The Knights Stone Not much is known of the Dalle des Chevaliers, or Knights Stone. Remarkably, this curious artefact is preserved in the Bérenger Saunière Museum. Many believed Saunière discovered the stone when he stumbled upon a tomb in an ancient crypt below his church. Later, a local historical society found it placed face down, functioning as a step in front of the Calvary, leading many to believe that Sauniere had little respect for the artefact. The stone, which is horribly weathered, dates the church to the time of the Carolingians or even Visigoths, and thus serves to establish the sacredness of the village in ancient times. 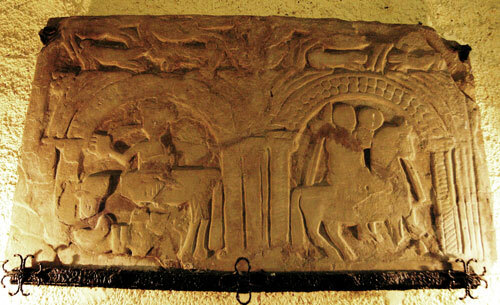 The Knights Stone portrays two scenes, each consistent with the Carolingian style of the 8th century. The popular interpretation is that the primary scene depicts Sigebert IV, the infant son of Dagobert II being carried by a horseman to his mother in Rennes-le-Château, the Visigoth princess, Gisele de Razes. Others speculate that the Knight is carrying the Holy Grail. Running along the top of the stone is what appears to be a hunting scene. The entire stone is faded and overall, its meaning is inconclusive. The Devils Chair A worn path once led from Rennes-le-Château to the Devils Chair of Rennes-les-Bains. The chair resembles a Neolithic armchair, carved from stone. It sits alongside a sacred spring, and is said to have been carved in 1800 for hunters who sat silently in wait of an approaching wild boar. 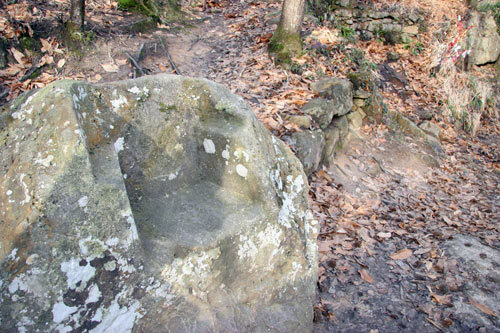 The Devils Chair faces due east and contains two curious carved symbols. The first is carved into the seat of the chair and appears to be an ancient Christian symbol, or possibly an Egyptian ankh. 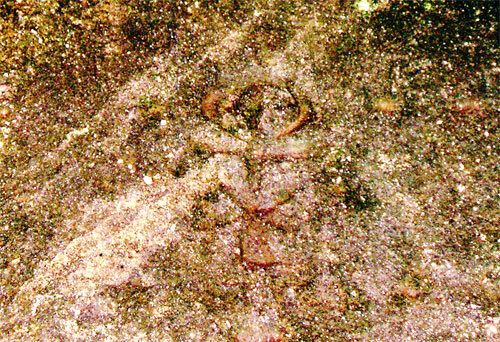 The second symbol resembles a Sun, or Moon, and is carved into the back of the stone chair. Ancient Stone Structures of Coustaussa Just beyond Coustaussa, the village where Abbe Giles was assonated (see Secret of the Abbes) are the remains of what appears to be an ancient settlement. It’s known locally as the ‘Grand Camp’ and consists of roughly carved stone walls over six feet high and dozens of stone houses, known as Capitelles. The structures are in a state of decay. Sadly, and surprisingly, they have not been dated and in fact seem to defy classification. The presence of the Capitelles so close to Rennes-le-Château is intriguing, for it presents the only plausible explanation of Rennes-le-Château as Rhedae, the ancient capital of the Visigoth kingdom, which is said to have supported more than 30,000 inhabitants. This is doubtful, however, as the stone huts and ramparts on the hillside of Coustaussa appear to be of a more recent origin. Poussins Tomb A couple of miles east of Rennes-le-Château is the alleged setting of Nicolas Poussin’s Shepard’s of Arcadia painting. Although it is known locally as Pontils Mill, enthusiasts refer to it as the ‘Poussin Tomb’. Saunière is said to have acquired a replica of the painting on his trip to the Lourve, in Paris. The painting contains the phrase ‘Et in Arcadia Ego’, meaning: Even I, Death, am in Arcady. The tomb was destroyed in the 1970’s and there is no record of a gravestone on the site prior to the early part of last century. They argue this is significant, given that Pontils Mill resides in a village named Arques. Henry Lincoln was the first to call attention to Pentagrams in the landscape around Rennes-le-Château. The precise geometric shape are formed via lines dotted with churches, standing stones, wells, castles and most interesting naturally formed mountain peaks at precise distances from each other. There is no denying the significance of the pentagram in the mystery of Rennes-le-Château. From the strange carvings on the house in Alet-Les-Bains, to the huge pentagram in the Cathar initiation site near Montségur, to the 8 year cycle of Venus, the celestial counter part of Mary Magdalene, the significance of the shape remains an enigma. Intriguingly, the naturally formed mountain peaks identified by Lincoln due form an uncanny natural pentagram. There is reason to be sceptical however, as the entire emphasis on the geometry of the paintings and landscape comes about after Gerald de Sede informs Henry Lincoln that the tomb in Poussin’s Shepard’s of Arcadia exists near Rennes-le-Château. Further, analysis by researchers and writers Bill Putman and John Edwin Wood indicates that the pentagrams in the landscape occur within the realm of expected probabilities. The research of Andrew Douzet has concluded that Abbe Sauniere commissioned a model just before his death that depicts the Tomb of Jesus Christ in a region called Perillos, near Perpignan, approximately an hour’s drive southeast of Rennes-le-Château. Douzet claims that Saunière had frequented the area and was aware of the fact that Christ is buried there. The model was commissioned by Saunière but never collected from its maker, as Saunière died before it was completed. Abbe Giles and Abbe Boudet each worked in Durban, just to the north of Perillos, so it is possible that Saunière visited them or was aware of its alleged secret. Douzet claims to have identified the place names on the model of the Calvary Mount, in and around Perillos, by using pre French Revolution (1789) maps. The place names he has identified in the region of Perollis include ‘The Hill of the Skull’, ‘The Garden of Olives’, ‘the cistern of St Helena’ and the ‘Oratory of St. Simon’. So, like the Priory Documents, the Archaeology and Artefacts of Rennes-le-Château are fascinating, albeit inconclusive, and frequently suspicious. Does the evidence suggest a mystery? Perhaps. There are other Archaeology and Artefacts of significance in the Legend of Rennes-le-Château. Foremost amongst them are the Church of Saint Mary Magdalene and the Tour Magdela, which I have discussed separately (The Grail and the Grotto). Alternatively, we must ask if the evidence itself is the true mystery? Who are the puppet masters and who are the puppets? The answer to this question has long been understood in France, although the English speaking world has only recently come to grips with the fact that Pierre Plantard, Gerard de Sede and Philippe de Cherisey, amongst others, have manipulated the story with great skill and panache, over a considerable span of time. What was their motivation? Was it political? Was it monetary? Or was it just a gag? And were they puppets for another, greater, invisible puppet master? The thing about Rennes-le-Château is you never know for certain. Philippe de Cherisey; the Puppet Master?